Once upon a time, the child stars of Dance Moms were off limits, both for viewers and the show’s mothers. The moms could trash each other as much as they wanted, but they generally avoided insulting the dancers. And, with a few unfortunate exceptions, viewers followed suit. Now that the gals have grown up a bit, people seem more willing to make fun of them. Viewers are especially critical when the girls act out, seemingly forgetting that it’s perfectly normal for young kids — and teenagers — to misbehave from time to time. During tonight’s episode, most of the social media hate was targeted at Kendall Vertes, who, to be fair, was not on her best behavior. Kendall was upset that she was not able to perform a duet with her BFF Maddie Ziegler, who was too busy with her budding career to spend sufficient time rehearsing the routine. Abby Lee Miller decided that it would be better to have Kendall do the duet with JoJo Siwa, or perhaps to have one of the girls perform the piece as a solo. Suffice to say, Kendall was not happy about this change of plans. Upset, she stormed out of the studio. No, Kendall’s response was not ideal, but it also wasn’t particularly unusual for a 13-year-old girl under extraordinary amounts of pressure. It’s normal for young teens to act out, and while they should certainly be reprimanded when they behave in an inappropriate manner, they should not be mercilessly attacked on social media. It’s fair game for viewers to voice concerns regarding Jill Vertes’ parenting style, but they should not be calling Kendall names or suggesting that she be medicated. The Dance Moms girls have to deal with enough as it is — the last thing they need is hate from unsympathetic viewers who don’t understand the reality of dealing with crazy mothers, an even crazier dance teacher and a ton of social media hate. The same people who are trashing Kendall probably exhibited some of the same dramatic tendencies when they were teens. A little empathy would be nice. 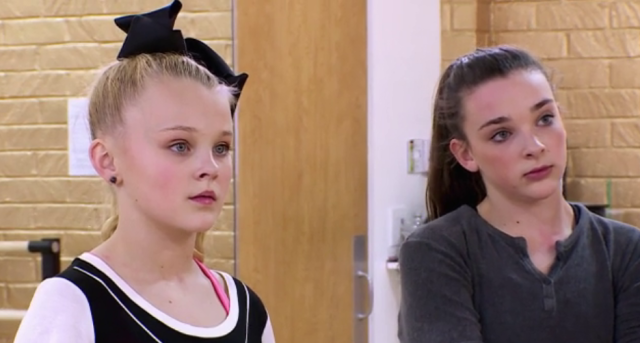 What did you think of Kendall Vertes’ meltdown on Dance Moms? Does her behavior prove that Jill Vertes is a bad mother? Or is it typical behavior for a 13-year-old girl in the limelight?